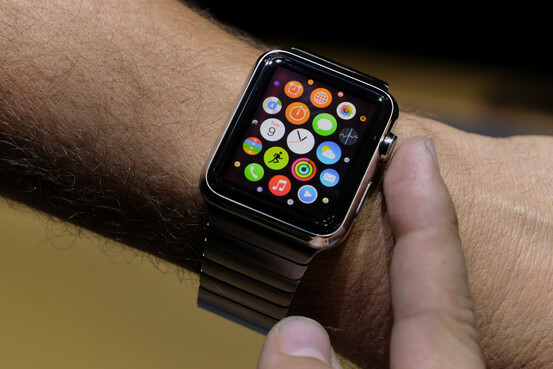 The Apple Watch is officially here. Now, the question is whether you will wear it. The iPhone maker pitched its latest product line since the iPad during an event Monday, answering critical questions about features, battery life and its compatibility with Apple Pay. But the watch wasn’t the only news announced in San Francisco Monday. During the event, the company also announced a new Macbook and an Apple TV deal with HBO, and shed light on a handful of products that could make an impact on the local tech industry including its automotive and payment initiatives. Here we take a look at some of the potential impact of the Apple Watch on the local technology industry, and break down some unexpected, yet potentially important, other announcements made during the company’s busy news conference Monday. Leading into the event Monday, the critical question facing Apple executives was whether a watch was worth the wait. On Monday, Apple Chief Tim Cook pitched the product as hyper-personal device made to serve as a companion to the iPhone and more than anything, to offer a convenient and time saving-alternative for many core tasks. It’s still unclear whether the Apple Watch will meet the unimaginable expectations set by the iPhone, but the device is poised to make a much larger impact on the local technology industry than its predecessor, the iPad. Smaller, and with an emphasis mobility and interoperability, the watch provides a more adjacent platform for local applications than the iPad which is primarily used in home. A striking example is Apple Pay, the company’s ambitious mobile payments effort. During the event Monday, Kevin Lynch, vice president at Apple, demonstrated the integration between Apple Pay and Apple Watch, which people can use transact with Apple Pay-partners. The company also announced third-party applications from Uber, Facebook and WeChat. One of the big unanswered questions was battery life. The company said Monday that the watch will offer “all day battery life” although its still unclear whether that accounts for heavy use of applications. What is clear about Apple Watch is that notifications will serve as the primary interface for third-parties applications. Within the application, developers offer a more accessible alternative to pulling out a phone, but its the Watch’s unique notification system that will allow developers to build new, more meaningful experiences that currently available on the iPhone. Notifications on the Apple Watch are far more rich than on the iPhone, allowing developers to include Images and actions as well as text. One of the smaller, but potentially critical announcements centered on an increasingly important device for local content and application creators: the car. Apple announced Monday that every major car brand has committed to CarPlay, the company’s software framework for auto applications. Tim Cook said that software will be integrated in over 40 car models by the end of the year. Effectively, the car is now an open market for technology companies. Expect every major local search company to quickly roll out CarPlay applications by the end of the year. The company said Monday that Apple Pay is now accepted in over 700,000 retail locations worldwide, making it officially accepted in the retail community. Cook also said that 2,500 banks now support Apple Pay, up from the six that participated when the product was launched in November. Can you replace the battery in the Apple Watch Models?